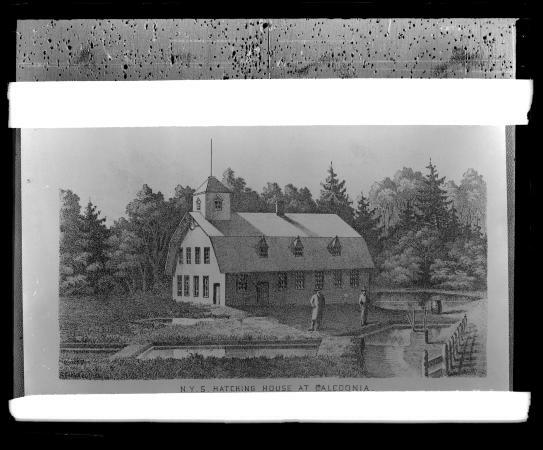 Drawing of the Caledonia Fish Hatchery in Caledonia, Livingston County. The drawing may date from the nineteenth century. See also images NYSA_14297-87_411 and 490 for other views of the Caledonia Fish Hatchery. This image was created to record the game fish activities of the New York State Forest, Fish and Game Commission. Source: New York State Archives, New York (State). Conservation Dept. Photographic prints and negatives, [ca. 1904-1949], 14297-87, SARA No. 1690.